Trials of Osiris is now playable every Friday-Monday, and you’re able to access the mysterious Lighthouse location as long as you meet a simple condition: Flawless victory. Click here for a Trails strategy guide, with tips for each subclass. To gain access, you’ll need to compete in the Trials and earn a victory in each game. You can lose individual rounds, you just aren’t able to have any ‘red marks’ on your Trials Passage scorecard. Once you win 9 games you’ll be given access to The Lighthouse from the Director screen. This location is considered a social space, and you’ll be able to visit by yourself or with your fireteam. There’s a chest at this new location that’s got some incredible loot! You’ve not only got the chance at Exotics, 9 Passage Coins, 4+ Motes of Light, & Etheric Light, but also the new Adept Trials weapons. The Adept weapons are elemental versions of the same primary weapons that you can buy at Brother Vance. Each element will be randomly rolled at the time of pickup. The loot from the chest is only available once per week, per character. You’ve got 3 chances to loot the chest per week. Can’t Get to the Lighthouse? Not everyone will earn a flawless scorecard, but that’s OK, because you’ve got basically unlimited chances – just acquire a new Passage ticket and try again. ToO will end at the reset, so until then, go in with your best fireteam and have at it. There’s also loot you can just buy from Vance, and you buy that loot with wins. In addition to buying loot, Watcher’s gear and cosmetic items can drop after each game. Or, buy the Exile (endgame) armor from Vance. Each week he will sell a different armor piece, but you’re able to get additional pieces from the Gold Tier package. This elusive exotic scout rifle has yet to be seen, and we currently do not know anything more about how to acquire it. 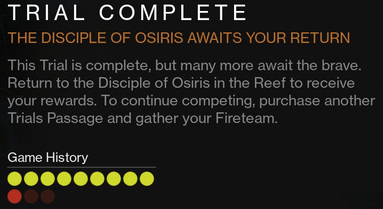 It’s assumed to be an Exotic bounty reward, but it’s not available for anyone as of yet.